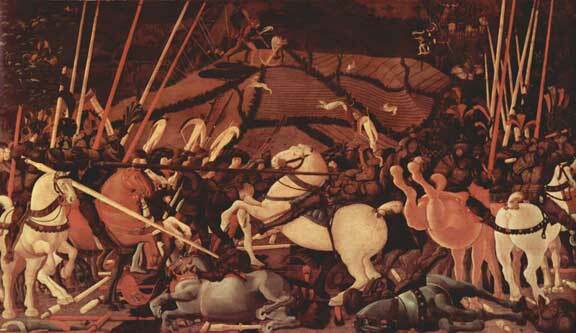 The Battle of San Romano. 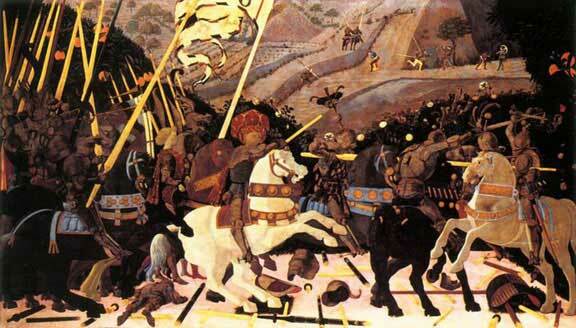 Paolo Uccello was born in Florence in 1397. He was apprenticed to the sculptor and metalworker Lorenzo Ghiberti and was admitted to the painters guild in 1414. Paolo was also a lifelong friend of Donatello. He married Tomasa Malifici in 1453 and a son, Donato was born in the same year. By 1456 the couple had also produced a daughter, Antonia. "Oh what a lovely thing this perspective is!" 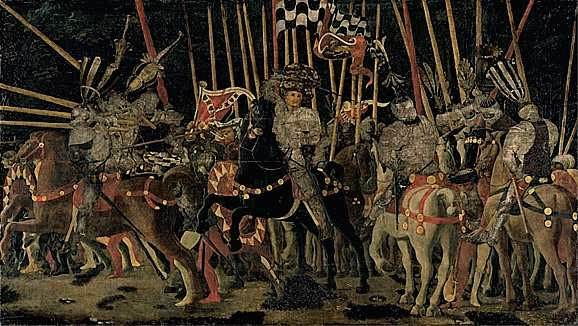 His most famous work is The Battle of San Romano. There are three panels, one in the National Gallery in London, one in the Uffizi in Florence and the final panel is in the Louvre, Paris. Detail showing the foreshortened soldier in The Battle of San Romano. This is probably the artist's best-preserved picture and it clearly shows his fascination with perspective. The broken lances on the ground all point to a common vanishing point as does the fallen soldier who is foreshortened in one of the earliest examples of this type of painting. Going to be controversial here, I don't like this version. I have seen this and the one in the National Gallery in London and the difference in quality is staggering. The painting has suffered from some poor restoration and from the passage of time, it does just not seem as impressive as the London version. I feel it is important to say what you dislike in the world of art, everyone has their own opinion. If you feel that a heap of bricks on the floor of the Tate Modern does not do it for you say so. This work has quite a Gothic feel with its stylised pageantry taking president over the realism being pioneered by other artists of the period. 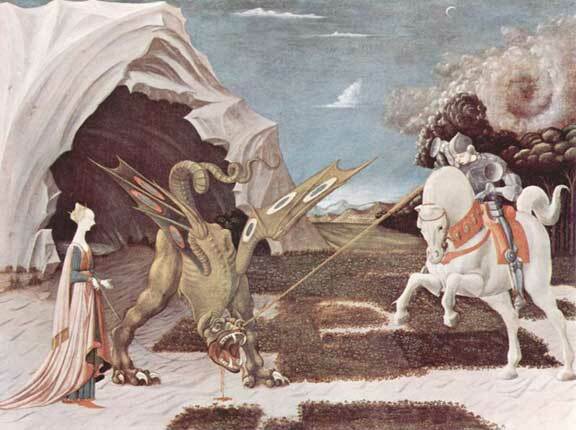 This is Uccello's last known painting. It shows how well he understood perspective, with the hunters, dogs and horses all disappearing into the forest in the distance. A lasting testament to a great artist. He died on 10th December 1475 aged 78.